Communication from Esteban Rivera: The flag of Medellin is white and green in equal stripes with the town's coat-of-arms in the center. White symbolizes purity, integrity, obedience, firmness and eloquence; green represents hope, abundance, freedom and faith. The coat-of-arms in blue field shows a gold tower and above the door a shield checky, 7 parts blue and 8 gold. In the upper part two towers and between them the image of Nuestra Sen~ora de la Candelaria (Our Lady of the Candelmas), the town's patron saint; the coat of arms of Medellin was granted by Royal Grant given in Madrid by King Charles II. The Revista Credencial is dedicating several editions to the history of the Colombian cities which are capitals of Departments in Colombia. On the Edition 230 of February 2009 it features the history of Medellin. It mentions that the Escudo de Armas (Coat of Arms) of the city was granted by Spanish King Carlos II (Charles II) in 1678 after the Villa de Nuestra Señora de La Candelaria de Medellín was established. The image of the Coat of Arms can be seen here. There's also an official description on the official website of the city. Flag of Metroseguridad (=Metrosecurity). It is a company owned and run by the Government of the City of Medellin, Colombia. This public company is in charge of much of the security of Medellin, operating with authorized Police and other security personnel for the safety of the City. Official website: <www.metroseguridad.gov.co>. Note that it has the same color structure as the flag of Medellin. The Metro de Medellín is an urban train that crosses the Metropolitan Area of Medellín from North to South and from Centre to West. As one of the first experiences of modern mass transportation in Colombia, the Metro of Medellín is a product of the urban planning of the Antioquia. The city of Medellín and its urban complex (ten cities in the Aburrá Valley), is a city with relatively recent industrial development that started in the 1930s. The streetcar (tranvía) at the beginning of the 20th Century can be considered as predecessor of the 21st century Metro of Medellín. The company known in Spanish as Empresa de Transporte Masivo del Valle de Aburrá - Metro de Medellín Ltda was created on May 31, 1979. The Transportation system began operations in December 1995. The company also operates the first world integration of a trains urban system with an air cable, called Metrocable, which started operations in July 2004. It is a publicly owned company (The State, Department of Antioquia and the City of Medellin are its main shareholders). The flag is a white rectangular flag, with two stripes in the middle, same size each, top yellow and bottom green, with the logo in the middle. 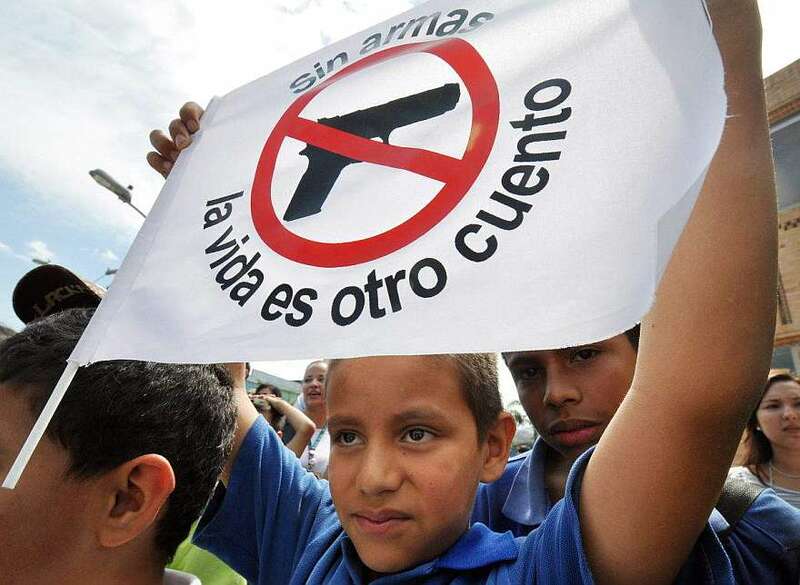 The flag is on white background and in circular shape it reads on top in small black letters "sin armas" (without weapons), and on th bottom "la vida es otro cuenta" (life is another story). On the middle there is a M1911 pistol with the prohibition sign (red circle with diagonal line from left to right). I have also seen this flag displayed on a local Police station in the neighborhood of El Poblado in the city of Medellín, thus it is an official flag. Medellín and its Metropolitan Area - Medellín, the captial of the Department of Antioquia, together with other municipalities, form the "Área Metropolitana del Valle de Aburrá, or Metropolotian Area of the Aburra Valley. This is for economic purposes, in order to get more funds from the central government. They have an English page available too: <www.metropol.gov.co>. This "Area" is made up of 7 municipalities, which are as follows: Medellín, Bello, Barbosa, Copacabana, La Estrella, Girardota, Itagüí, Envigado, Caldas and Sabaneta. (Each one has its own flag, anthem and Coat of Arms). The flag of Área Metropolitana del Valle de Aburrá is the logo on white background. The Área Metropolitana was established in 1980 and regulated by Law No. 128 of 1994, and Law No. 99 of 1993. Plaza Mayor - Medellín, Convenciones y Exposiciones (Mayor Square - Medellin, Conventions and Expositions) was established in March 2006 as a merger between the Palacio de Exposiciones (Expositions Hall) and the Centro de Convenciones (Convention Center) to give Medellín an integrated space in its projection as an ideal venue for business and conventions as well. This organization is a mix between public and private capital, having as major shareholders the Alcaldía de Medellín (Medellin Mayor's Office), the Cómara de Comercio (Medellín Chamber of Commerce), and the Federación Nacional de Cafeteros (National Federation of Coffegrowers). One can see in the Manual de Imágen Corporativa (Manual of Corporate Image) the logo's official colors in CMYK, Pantone and RGB codes (page 4), as well as a construction sheet (page 7). 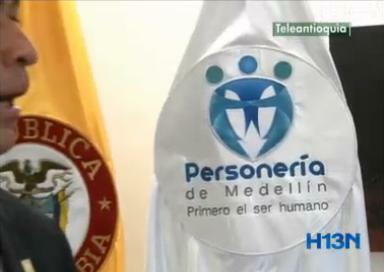 Today on Hora13 Noticias, a local news broadcast, the flag of the Personería de Medellín is seen. Personería de Medellín is the organization in charge of the defense and safeguard of the citizens' rights and operates at the local level, that is, city-wide. It's kind of a mixture between the Defensoría and the Procuraduría. The Procuraduría de Medellín was established more recently by Agrement No. 63 of 1932, its roots date back to the XIXth century. 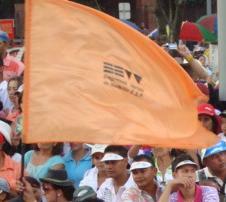 The flag of the Personería de Medellín is a white horizontal flag with the logo (Source: http://www.adalid.com/espanol/clientes2.html) in the middle. For additional information please go to: Personería de Medellín (official website). 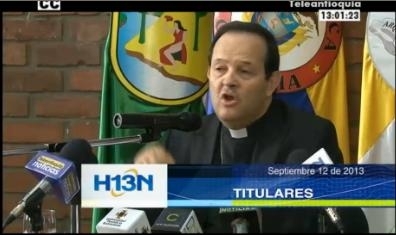 Today on Hora13 Noticias local news one can see the flag of the Roman Catholic Church Archdiocese of Medellín. The Archdiocese was established on February 24, 1902, but dates back its roots to the XVIIIth century. 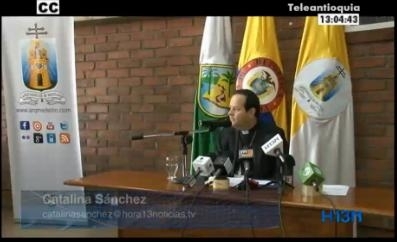 It is the same yellow and white flag with the Coat of Arms of the Archdiocese of Medellín in the middle on a white disc. EEVVM (Empresas Varias de Medellín, Medellin's Multiple Companies) is a local Government company in charge of sanitary public services in the city of Medellín. It was established by Acuerdo (Agreement) No. 59 of September 11, 1960 by the City Council, as "Empresas Varias Municipales de Medellín" (Medellin's Municipal Multiple Companies). It was given this particular name because of the multiple tasks it had when it was founded, since it was in charge of the PLaza de Mercado (Farmer's Market), Feria de Ganados (Livestock Fairgrounds), Matadero (Slaughterhouse), Transporte Masivo (Mass Transportation) and Aseo (Sanitation). Today the company is formally called "Empresas Varias de Medellín E.S.P." (E.S.P. stands for "Empresa de Servicios Públicos, Public Services Company). The flag was an orange rectangular flag, with the logo in the middle, in black lettering, as seen during the local Flowers Fair parade. Since November 1, 2013 EEVVM will pe part of the holding Grupo EPM (EPM Group) (EPM standing for Empresas Públicas de Medellín, Medellin's Public Companies), a holding that encompasses 45 companies (national and international), in order to gather all the companies that provide local public services such as telecommunications, sanitation, water and energy basically. EPM nor Grupo EPM have a known flag. or additional information please see: EEVVM (official website). 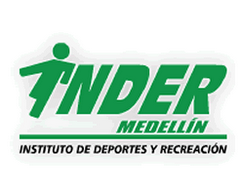 INDER (Instituto de Deportes y Recreación de Medellín, Medellín Institute of Sports and Recreation) is Medellín's local government organization in charge of managing the city's indoor and outdoor public sports and recreation facilites. The flag used to hang right outside the entrance of the UD (Unidad Deportiva, Sport Unit) Atanasio Girardot, in the Plaza de Banderas (Flags Square), but since the wind tore most of it out, no replacement flag with the new logo has been placed.